Maximum Queen/Mario/Muppets Youtubage… This is great! I think I saw them both on the Daily What, can’t remember as I’ve done a looot of surfing with school and work being slow. Brad Delong points out what happens when an author wants an endorsement for a book (almost) everyone hates. In this case, it is the American Enterprise Institute’s book, Dow 36,000 (For people my age: there was a portion of the population, perhaps most famously Larry Kudlow, who believed 36,000 was where the Dow would be by around 2010. One of the points this book tries to show is that stocks are no riskier than Treasury bonds, in the long run. This ridiculous point of view has actually gained more traction than you might think). Anyway, they needed a nice blurb to put on the back of the book, so they decided to “quote mine” and put poor finance journalist Allan Sloan’s good name on the back of their dirty book. See the “before” review and “after” quote here. According to the Chicago Tribune. The FBI only released some of its documents on Terkel, suspected Commie. Apparently the rest was just too damning to release. Or something. Is it odd that the FBI wasn’t able to suss out whether a writer as prolific as Terkel was a Capital-C Communist? Were they left with insufficient material to work with? Did they just open a file on me because I used a weird Australianish word like “suss”? In unrelated items, just because Terkel would be about 97 years old today, I laughed at the HuffPost take on “Things Younger Than Sen. Byrd.” Hint: They include sliced bread. But in fairness, I bet Byrd could still take the guffawing little wimp who started that thread (I’m going to go ahead and guess it was a guffawing little wimp). Respect your elders but trust no one over 30, say I.
I wanted to go out and buy Sarah Palin’s book. Not because I admire her rogueness, but because I wanted to be able to say that I, like Sarah Palin, have read much of the book written for her. But people are ruining my fun here, and I may just have to go find something else to do. Why are people nitpicking at the ‘factual’ stuff that really means nothing? They could attack so many things, or just give their opinion on the book, but instead the trend seems to be to contradict facts that have no importance whatsoever. Thanks but No thanks, or whether her family had a ‘vote’ before she accepted McCain’s outstretched hand. I think Thanks but No Thanks is more important there. I’ve been enjoying Chaos, by James Gleick. The 1987 book looks at chaos theory from different angles: the mathematician’s, the scientist’s, the biologist’s, the meterologist’s, the artist’s… and combines them in a survey of the theory as it has grown in the past decades. I love that some of the most important contributions came from people influenced by past scientists who had long ago lost their pull with the scientific community–where Newton’s theories had won out on color, Goethe’s where dismissed as “pseudoscientific meandering.” It took just that type of pseodoscientific meandering to take science to the fuzzy edges where established natural laws stop answering the questions. “Where Newton was a reductionist, Goethe was holistic.” That holistic mindset is at the center of many of chaos theory’s discoveries. There’s more to it than Jeff Goldblume in Jurassic Park, I promise. There’s also fractals. jk. “New geometries always begin when someone changes a fundamental rule. Suppose space can be curved instead of flat, a geometer says, and the result is a weird curved parody of Euclid that provides precisely the right framework for the general theory of relativity. Suppose space can have four dimensions, or five, or six. Suppose the number expressing dimension can be a fraction. Suppose shapes can be twisted, stretched, knotted. Or, now, suppose shapes are defined, not by solving an equation once, but by iterating it in a feedback loop. That was just a mathematical spot in the book, but the awesome thing is that Gleick captures the theory from different angles, and speaks to the outsider in the same facile manner Carl Sagan chats about apple pie and the universe. Lloyd Blankfein, CEO of Government Squid, said he was “doing God’s work.” GS facilitates a “virtuous cycle.” Why is everyone laughing? What if Jamie Dimon had said it? You all would cheer and cheer. I think Lloyd made a mistake, one we can learn about from Andre Agassi’s new memoir about tennis, and meth, and tennis. Agassi wore a wig. Not just any wig, but a big ‘ol mullet. If Lloyd had slipped a Kentucky Waterfall on his head, he might be getting the same type of admiration we reserve for the likes of Dimon (ok, the admiration we reserve for only Dimon). NPR has a good review of a new book by those two guys from the Nintendo games: When the Game was Ours, by Magic Johnson and Larry Bird. (For the record, Magic Johnson’s Fast Break > Jordan v. Bird). I actually used to talk to Larry Bird’s brother once a while in a past job… dude gave my number out to a bunch of people and I never could quite stop the calls from coming in (really, but it’s a long story). New book, K2: Life and Death on the World’s Most Dangerous Mountain, by Ed Viesturs w/ David Roberts. A good review in the NYTimes by Globetrekker‘s Holly Morris. I’ve met people who’ve topped Everest and plenty of other big climbs, but never anyone who’s topped K2. Anyway. I don’t tweet but the posts looked pretty much like Fox News’ twitter page. And I love that it took them a half hour to fix the little glitch. The Daily What has a link to an archived site of all of the posts. Interesting tribute to Obama: sculpture in flames!? Liu Bolin, the artist I mentioned a couple of weeks ago for his photography where he painted himself to become invisible against the city backgrounds, is apparently also a sculptor. Man, I have mixed emotions about this one: it sure feels disrespectful, with racist overtones, to me. I’ll leave it to someone else to argue the “on the other hand,” as I don’t think this is the most tasteful statement Mr. Liu has made. I’m surprised no one’s talking about this story. 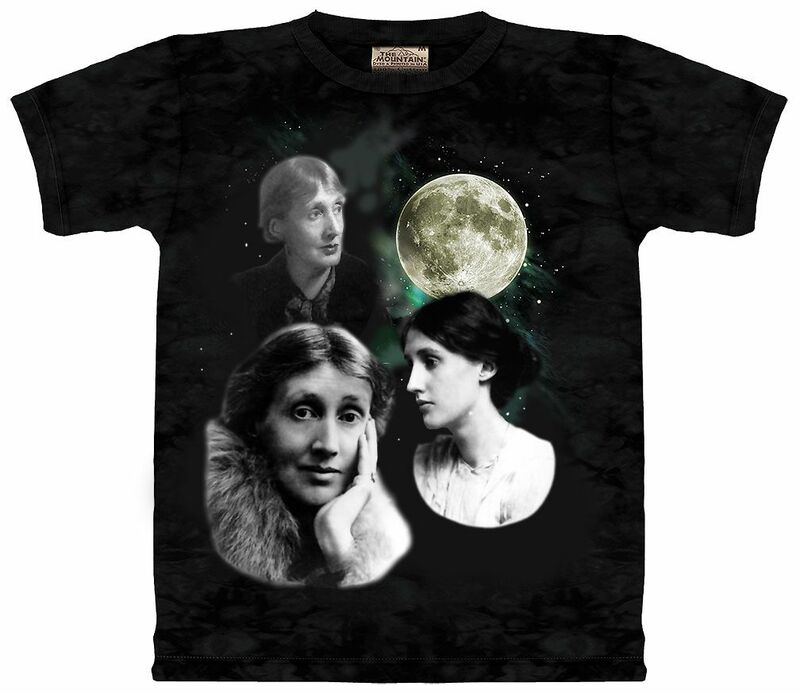 Into Flight of the Conchords AND Virginia Woolf? No? Well I am and if I had this shirt everyone would know it. The entire point of doing this blog was to force me to put something interesting I read on here every day. I have failed. So I’ll spill out a few of the books I’ve been reading lately. Then, freshly purged, I’ll be ready to get back to business. I finally bought a copy of Bailout Nation by Barry Ritholtz. It’s a fact-based, opinionated overview of the leadup to, and execution of, a messy free-money bailout by one market commentator I’ve found myself agreeing with almost every day (he’s got a blog). Lest I get ahead of myself, I might make comparisons to John Kenneth Galbraith’s write-up of the Crash of 1929. For a number of reasons let’s not go there, but I do believe this may be the book people pick up 30 years from now when they want to relive these glorious Greenspan-fed, post-Gramm-Leach-Bliley years. Related to the Gramm-Leach-Bliley Act*, last month I read an extremely short letter to the editor from former Citigroup CEO John S. Reed implying, but not saying, that the act that allowed Travelers and Citi to merge into Citigroup was a bad idea. That should have caused a bigger wave than it did. And meanwhile Government Squid is taking the rap for the entire industry while best seller biographies are talking about how dreamy Jamie Dimon, CEO of JPMorgan is. Dimon was with Citigroup throughout that move to get Glass-Steagall removed, and was in fact Simon Weill’s protege. But let’s forget about that and talk about how silky-smooth his hair is. See what happens when I hold back for a month without saying anything… I needs to VENT. Anyway, Bailout Nation gets the bailout right. I also read Hunter Thompson’s Rum Diary. Can’t wait for the movie (go to Totally Gonzo for the updates on that). In plot as well as in writing style, I can see how influenced he was by F. Scott Fitzgerald and Ernest Hemingway. The sentences are concise, even as they vividly describe life lived on hamburgers and rum-drunk anarchy. One of the few answers Thompson repeatedly gave when asked the ridiculous question “how can I be a better writer” was to type out a few pages from a classic book, to get a sense for the author’s rhythm (see Ancient Gonzo Wisdom). He nailed it. I’ll have to read the original version, the one written when he was 22, as this version was updated by him decades later for publication. What else have I read lately? I read Eugen Onegin by Pushkin, which I had originally put away because it was somewhat boring. I appreciate it, it’s just not for me. There are great passages in it, though, and anyone interested in the Russian authors that came after Pushkin should read some of his work to get a sense of place for the literary revolution that was about to unfold. I’ve been reading from the Qur’an for one of my law classes. The one thing I’ll say there is that you can read the Qur’an and get a few quotable passages, or you can really dig into the history of Islam, including the Sunnas and Hadiths, and the differing schools of Islam that exist today. I recommend the latter if you want a sense of what the Qur’an is saying. I read The End of Affluence by Paul Ehrlich as I could tell by its placement that the bookstore owner liked it. Can’t say I recommend that one at all. There are others, but I am starting to feel like I’ve caught up. *The Gramm-Leach-Bliley Act was the act by which Congress took down protections set up in the 1930s as part of the Glass-Steagall Act to keep banks from mixing investment business with conventional banking and insurance. More important to the sense of irony I felt as I read the two-sentence letter to the editor, Congress passed the act in order to allow Travelers and Citi to merge into the bloated, Too Big to Fail, off-balance-sheet nightmare that is Citigroup–some call it the Citigroup Authorization Act. Virtually every novelist in America fantasizes about being picked to appear on Oprah Winfrey’s talk show. But now an increasing number of writers have discovered a new champion: Glenn Beck, the outspoken media darling of populist conservatism.